The kitchen inside of a person's home is one of the most frequently visited areas, which is why our team of Nottingham kitchen fitters take every kitchen installation job that we receive very seriously. We know that the amount of quality that we put into our work will be reflected in the amount of quality reflected by the final product. It will be viewed by homeowners and their family, friends and visitors each and every day. This is why we are focused on doing the very best job that we can do in order to satisfy our customers and be able to exceed our customer’s expectations. The primary objective that our team of Nottingham kitchen fitters focuses on daily when it comes to Nottingham kitchen installation is making sure that we are aware of the needs of our customers and work diligently throughout all of our jobs in order to meet those needs. Before we begin any job, our team of kitchen fitters will meet with you to determine your expectations. After we have gathered all of the information that we need from you and our inspection of your home, we will then be able to provide you with our professional recommendation of the parts and services that our professional experts in kitchen installation believe are needed. We will take the time to thoroughly discuss all of the options that you, as our customer, have available to you and work with you further to work within your budget. Each and every one of our Nottingham kitchen fitters are skilled and have been thoroughly trained in Nottingham kitchen installation. We take the overall training and education of our kitchen fitters seriously, because we believe that it is highly important and required in order to be able to provide the very best service possible for all of our customers. Our goal is to gain your trust in us and in our work, which is something that cannot be accomplished if we are not continuously being trained and informed of all of the changes within the industry. Our team of Nottingham kitchen fitters is cross-trained in other services within your home as well so that they are able to provide our customers with a complete service package that meets all safety codes and updated regulations for your home. The combined years of experience within our team of Nottingham kitchen fitters and Nottingham kitchen installation allow us to be good at what we do, which is also reflected in the quality and precision of our work. One of the top priorities for our team of Nottingham kitchen fitters when it comes to Nottingham kitchen installation is being able to satisfy our customers with our work. This is one of the main reasons why we discuss our customers’ wants and needs before we get started working on any job so that we are all in agreement with each other and our team fully understands what they need to do in order to make satisfy our customers with what they have done. By providing our customers with an overall satisfying experience resulting in high-quality work, we know that our customers will come straight to us for all of their future kitchen needs. 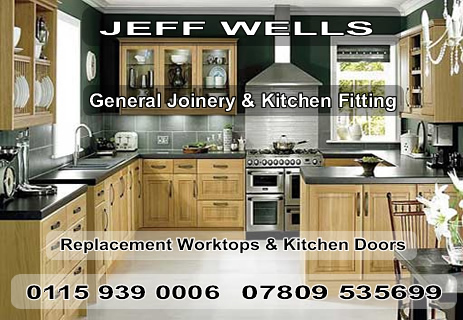 Carpentry & Joinery Jeff Wells is an established family firm specialising in the design, manufacture and installation of high quality joinery. We are passionate about the work we do which is why we also specialise in the reproduction of period joinery. With 25 years experience in this field, we service a broad range of clients from the domestic and commercial sectors including, long-established Building Firms, Insurance Companies, Architects, Surveyors, Housing Associations, Interior Designers, Developers, General Builders and Domestic Clients. We run a full Carpentry Service which encompasses all areas of carpentry ranging from hanging doors to fitting Kitchens for homeowners as well as providing the Construction Industry with qualified, experienced Carpenters.